It's Time to Let Loose with Looney Tunes! Let loose with your favorite graphic design Looney Tunes characters. 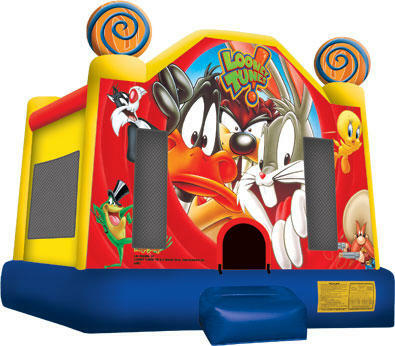 Join Bugs Bunny, Sylvester the Cat, Daffy Duck, the Tasmanian Devil and Tweety the bird for a fun day of playing and jumping in this Colorful and happy inflatable bounce house. This Bouncy has large windows to keep the kids cool inside while the parents watch their kids have a bast inside. It also features a safety inflatable ramp with a safety net at the entrance. This Bounce House measures 13ft wide by 14ft long and 15ft tall.